GPS coordinates for Europe do NOT match? I am about to do some graphical analysis with the georeferenced data for Europe in the way it is done in the "San Francisco Crime.jmp" sample. Surprisingly i have noticed that the geo-points i´ve got are wrongly placed on the map in the graph builder. 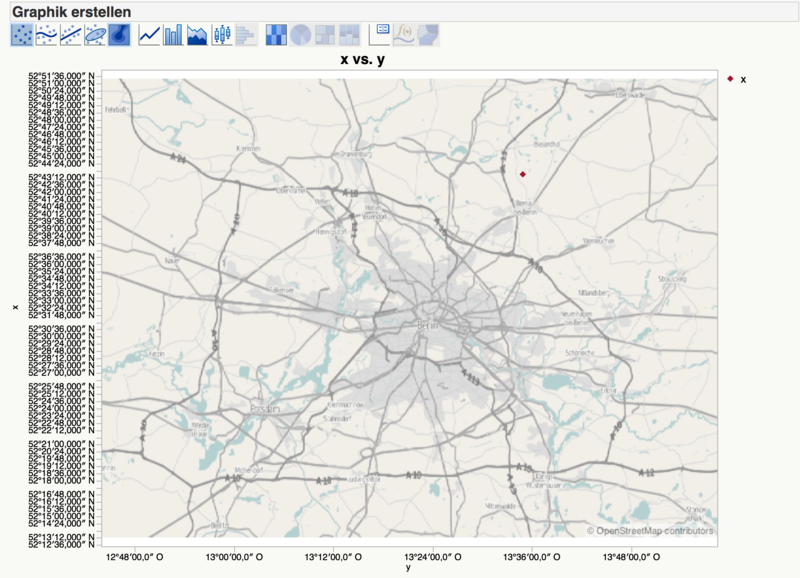 Here is an example: i have obtained the latitude and longitude for some building in southern Berlin (using google maps or openstreetmap) and put that data in JMP to show it on the background map using graph builder. The point appears then on the wrong place lying outside of Berlin (see attached image). How do i get that data-point placed on the right places? Re: GPS coordinates for Europe do NOT match? Your original latitude, longitude values are 52.516316, 13.377825 respectively. That is not the same as 52°51′63″ N and 13°37′78" E. Your original values are degrees in decimal format. They are equivalent to 52°30′59″ N and 13°22′40" E. For example if your latitude was 52.5, that is equivalent to 52°30′, since .5 degrees equals 30'. The issue is you are entering the original values as if they are already degrees / minutes / seconds and THEN changing the format. When you enter the values you have to enter them in the CURRENT format, since that is how they are interpreted. Simply enter the values into the two columns as decimal values (52.516316, 13.377825). Then change the formats to the geographic formats and it will display the values in the new format. Note, the values didn't really change, it is just the way they are being interpreted / displayed. I created a new data table and entered the lat/lon as decimal values, then I changed the formats. Attached is a Graph Builder plot, showing Brandenburger Tor plotted correctly (notice the little black dot in the center), along with the data table and values in Degrees / Minutes / Seconds format. Not sure why you are seeing what you are. I grabbed a few points from a Google Map around Germany (using the right-mouse-click What's here?). I plotted those points on a map in Graph Builder and the points where plotted correctly. I notice that your x-axis has a Y label and your y-axis has an X label. But the coordinates appear to be correct, with latitude on the y-axis and longitude on the x-axis. Would you mind telling me the coordinate you are plotting? If you want, you can send me your JMP data table with your coordinate(s). I'll take a look at it and see what I can figure out. I'll send it back to you with a script showing Graph Builder with your points plotted correctly. I think i´ve got an idea why the points are shifted on the map. I grabbed the coordinates of Brandenburger Tor in center of Berlin (52.516316, 13.377825), switched to the JMP-starter and pushed "create new Data Table" button. Than i put the coordinates into two columns like this 52 51 63 and 13 37 78. Than i went to the properties of each column and assign the geographical format (latitude GMS/longitude GMS) to them. Than i pushed OK and WHOOOOOPS - the data was changed. I got 52°52′03″ N and 13°38′19″ O instead of 52°51′63″ N and 13°37′78″ O. The same happens to all data i import to JMP when i apply the geographical format on it. This is why all my the points are plotted on the wrong place. But the question is how do i avoid this? It looks like JMP treats the "number" as a string. Change to comma instead of period as decimal mark before setting the geographic format. Thanks a lot!!!!! That was a point!!! This is probably because of German layout on my mac. flood: how can i mark both answers as helpful?